I once met a lady who struggled with depression. She was hopeless and did not have a good outlook on her life and our first encounter consisted of her telling me how she didn't think anyone could help her. She was extremely stressed out with work, she didn't have any help at home and felt as if she didn’t have anyone else to turn to. She thought just for a second that if she went to the hospital her life might change for the better. She was ambivalent when she arrived because she didn't know what to expect and was afraid to trust us as professionals. But over a matter of days, she became comfortable and open to the options that we were able to provide for her. She allowed for us to talk to her family and together we were able to identify her primary issues. Surprisingly, we found out that her family wasn’t even aware of how she was feeling because she had become so good at making everything seem so perfect. Thankfully, her husband agreed to help out more and found ways to make "home life" better for her. After a couple of weeks of taking medication and learning about coping skills, she was open to talking more about ongoing treatment. And after being discharged a few days later, she followed the treatment that was recommended and overall felt good about her decision to seek help. That was her experience with dealing with mental health, but she is not alone. More than ever, women are being led to seek help due to over their over-demanding lives, not prioritizing self-care or trying to keep up with society's expectations. Through my job, I encounter women who experience depression, anxiety, bipolar, and panic disorders, just to name a few. And I often meet with them daily to discuss the issues that they are experiencing. At length, we discuss what I can do to help their current situation, whether it's recommending that they see a psychiatrist, therapist, or another program that will improve their mental health needs. But unfortunately, many of my patients either refuse to talk about their issues and prefer to go home, or they believe being in a mental health facility is beneath them. I have been in the mental health field for ten years, and have noticed a few common issues among the women that I help from all different ages. Most women put themselves last when it comes to self-care. For some women, they are the sole provider for their family. And while we think that married women have it easy, they still have to be a wife to their husband and pick up any slack their spouse may leave behind. When women come into the psychiatric facility, I often hear them say, "I came here to get a break from home." They want to shut the noise of hearing their name being called throughout the day, and want to learn how to focus on themselves for once. Some women are so used to taking care of others that they do not know how to put themselves first or have forgotten what that means. Some women are so used to taking care of others that they do not know how to put themselves first or have forgotten what that means. I also talk to young women (ages 21-33) who feel alone and don't know where life is going to take them. This uncertainty often leads to depression, anxiety, and many other mental disorders. They often either struggle in their love life or they feel self-conscious about their looks because they believe their bodies are not "acceptable.” Being a woman is difficult, and unfortunately society places a lot of demands on our outer appearance when all we want to do is feel accepted. As a culture, we have to change what a "perfect body" looks like because it is killing the women in our society. A lot of women come into the psychiatric facility wanting to take their own life because they do not feel apart of a community and feel as if they are "unfit." To talk them through it, I question who they are wanting to impress and why their opinion matters and I don't think out of any of the women that I have asked, that anyone has had a legitimate answer. Unfortunately for some, mental health is viewed negatively. Often people think that if they seek help then they will be viewed as a weak person from those looking from the outside in. However, that to me is all fear. If you need help, go get it. It will only better serve you in the future. Mental Health is a silent disease that can grow unnoticed. You can be alone with your thoughts and as soon as something doesn’t go your way, depression sets in. You may want to take a leap of faith and branch away from that 9 to 5 job and start a business, but anxiety prohibits you from doing so. It's important to identify these mental blocks and seek help when you constantly experience these setbacks. Struggling with your mental health will stop you from pursuing your dreams and hold you back from living the life that was destined for you. Which is why it’s important to seek professional help from a therapist despite your fears or what you believe others may think. A therapist views situations in perspective you may not notice. Allows you to express yourself and get the feedback that you NEED instead of what you WANT. It's life-changing for those who invest their time into it. You can be honest with them without feeling judged. You learn how to face life stressors with strategies and skills. So your next question may be this...where do I find a therapist? It is a common misconception that seeing a therapist can be a financial burden, but it doesn’t have to be. You can always go through your insurance company, and if you are currently working, you can reach out to human resources to see if you have an Employee Assistance Program (EAP), where you can see a therapist for a set number of sessions. You can also search "free clinics" and locate a behavioral health center that will allow you to pay a sliding scale fee. The Anxiety and Depression Association of America (ADAA) also has a website where you can search for clinics in your area. Mental health is a part of our health and wellness. If we cannot help ourselves how effective could we be in helping others? 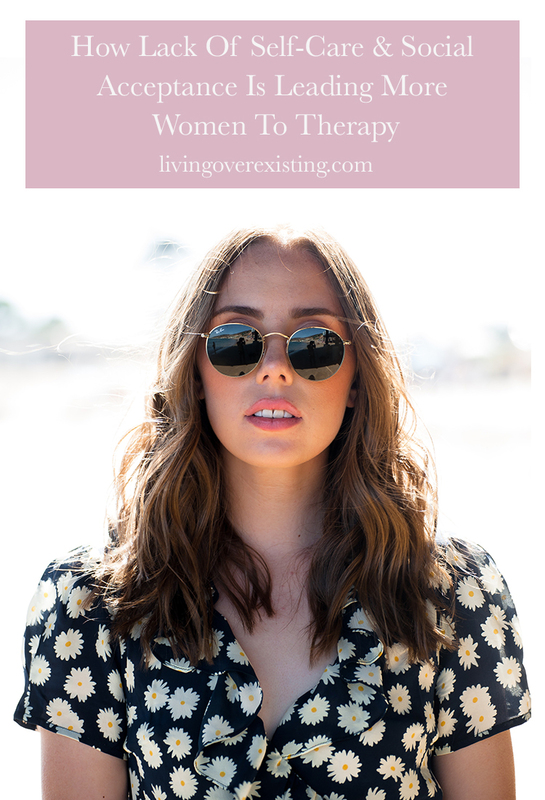 Jamie Rockymore-Bess is a mental health blogger who focuses on helping women who suffer from mental health issues with a mission to encourage women to beat the mental health stigma and find the help they need for a better life. Visit her website.